notes clear plastic sleeve. this version "may" be a silver backed factory produced cd, and not a cd-r.
it's numbered on the back of the inlay, which reproduces the original sleeve. the graphic on the cd is similar to the original record labels. 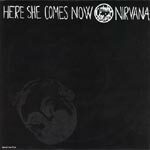 - "Produced by SUBPOP for the singles release in 1988 to coincide with the release of the Vinyl and audio tapes. 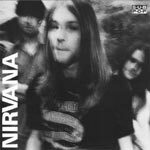 CD's were not a commonly used format at this time and a test batch of 1000 was to be released as Subpop's first move to Compact Disk. Apparently only 200 were actually made as Subpop pulled during production, the 200 were never released.. I purchased 8 for £400 whilst on holiday last year, from a Rare and collectable music shop in downtown New York. I was told that an employee of Sub Pop had sold them onto him a few weeks prior along with their story behind them." 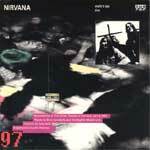 - "This CD single is extremely rare - MUCH MORE THAN ON VINYL! There's only a small number of them left out of the original 1000 that where manufactured back in september of 88. The release date for the "LOVE BUZZ" single was set for 11/98. However back then things where different and vinyl was still on top! Apparently the Local record stores would only accept the single on vinyl and the 1000 CD's where returned to SUB POP who shut them away in their big closet of leftover's. Out of the 1000 it's estimated that at least half were destroyed/thrown into a skip whilst clearing. The rest have been taken by employees for themselves or to sell. I've managed to get my hands on a small number of these rarities but don't expect to have them for long!" notes jewel box. numbered on the back of the front inlay, which reproduces the original sleeve. the graphic on the cd is a picture of side a of the original vinyl record.